File geodatabases - Stored as files and folders within a file system. These exist in two versions, the old format used by ArcGIS 9 and the new format used by ArcGIS 10 and subsequent. This topic discusses use of the old format file geodatabases. Personal geodatabases - Stored in Microsoft Access file format and limited to 2 GB. Enterprise geodatabases - Also referred to as "SDE" style geodatabases and stored within a database server such as Oracle or PostgreSQL. File geodatabases are recommended by ESRI over personal databases and, in the new format, are becoming one of the most frequent formats used to publish spatial data for use by ESRI applications. Old format file geodatabases are rarely encountered. ESRI provides an SDK, a software library, to connect to new format ESRI file geodatabases for read/write access. Manifold uses the ESRI SDK to connect to new format ESRI file geodatabases. Launching Manifold always includes ESRI file geodatabase capability for new format. 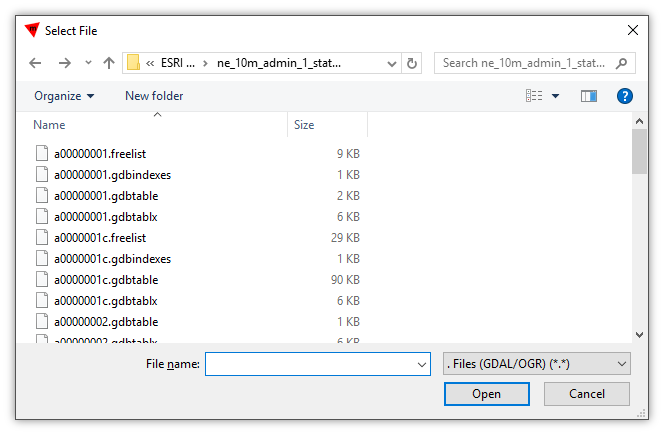 There is no need to install anything extra to allow Manifold connections to new format ESRI file geodatabases. 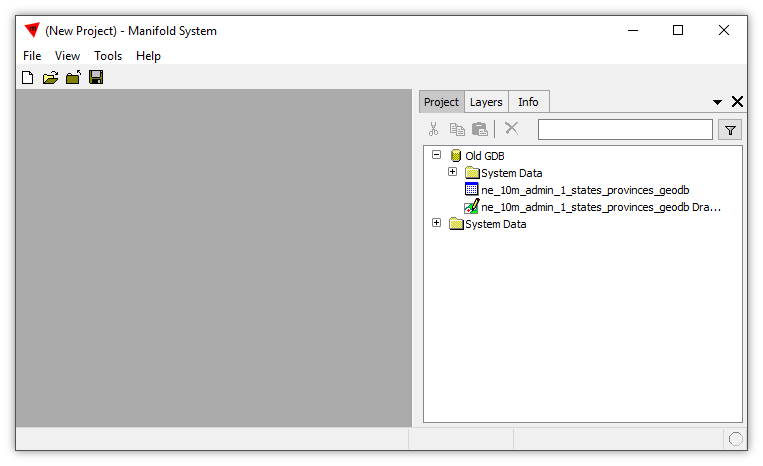 To connect to old format file geodatabases, Manifold uses the optional GDAL OpenFileGDB driver. 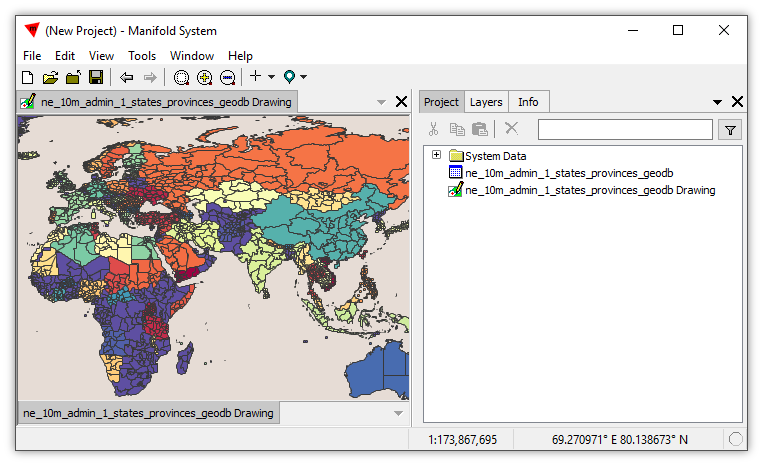 GDAL/OGR is an open source library for reading many different GIS formats. Manifold does not install GDAL/OGR automatically, but it is easy to download and install if we want to use it. 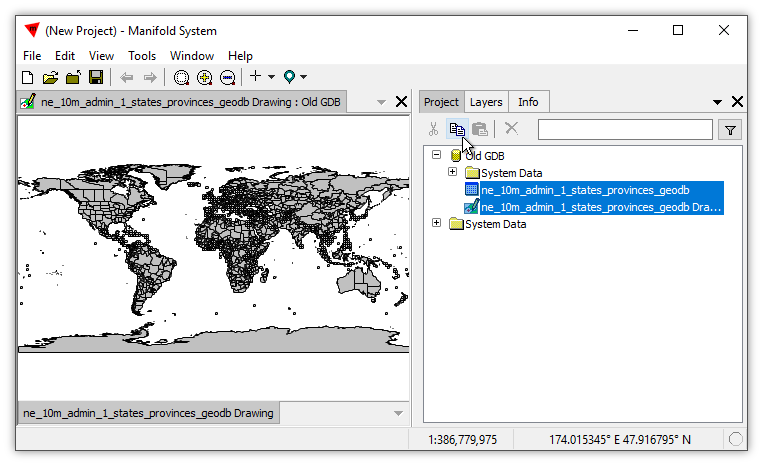 GDAL includes an older, reversed engineered, non-ESRI module that usually can read the older format and get much, often all, of the information it contains. To use GDAL or OGR we must install GDAL in Windows, and then we can use it from Manifold. If we do not install GDAL, we will not be able to use the capabilities described in this topic. See the the GDAL / OGR topic for installation instructions. The Manifold GDAL dataport allows working with GDAL 2.0.x, 2.1.x or 2.2.x and automatically selects the latest version available with automatic adjustments for the call interface. The GDAL GDB Driver is Read Only. 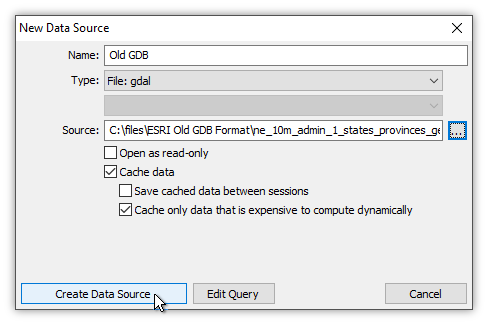 The GDAL OpenFileGDB driver can read ESRI file geodatabases but it cannot write them. Reads "old" ArcGIS 9 format file geodatabases. 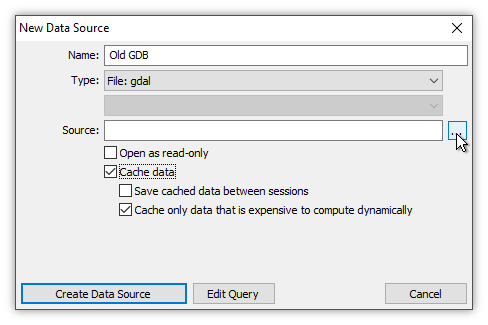 Although GDAL can read new format as well, the ESRI code for reading new format GDB that is built into Manifold is a better choice for new format file geodatabases. Cannot read compressed data in CDF format. Manifold reads/writes to modern ESRI GDB file geodatabase format but does not read the older, obsolete form. 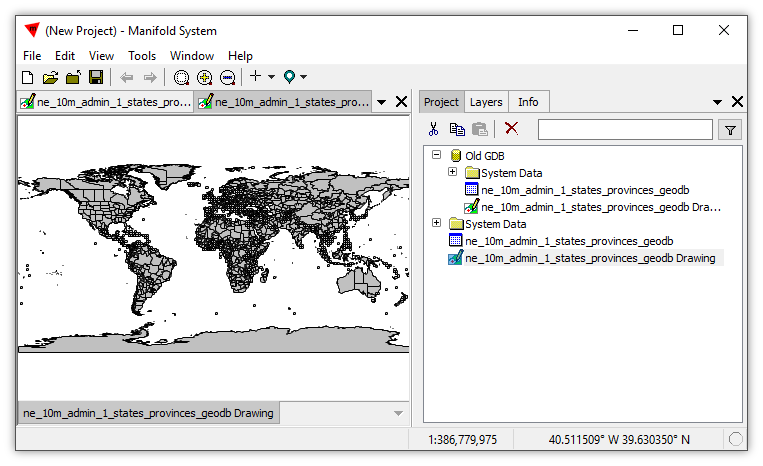 GDAL includes an older, reversed engineered, non-ESRI module that usually can read the older format and get much, often all, of the information it contains. We will import an "old format" GDB that is no longer supported by ESRI's SDK, but which is supported by the legacy GDB code in GDAL/OGR. We launch Manifold. In the main menu choose File - Create - New Data Source. Choose a Name as desired and a Type of File: gdal. Whether or not we check Open as read-only the resulting data source will be read-only. We un-check the Saved cached data between sessions box, to keep our project size smaller should we choose to save the project. Click the [...] browse button. In the resulting Select File dialog we browse over the folder where our gdb file is located. File geodatabases are usually stored in folders that contain many files so the gdb file may not be easy to find. 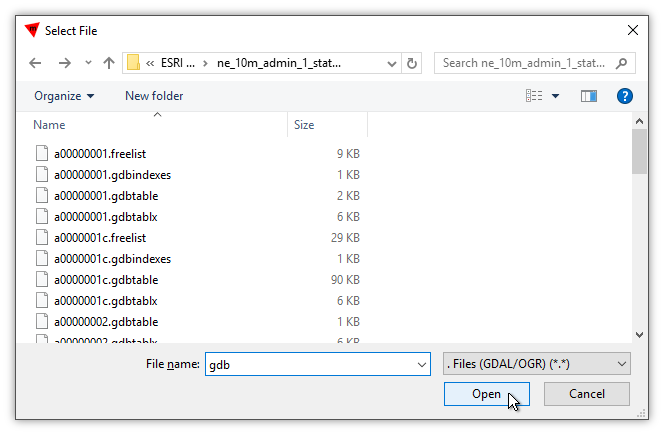 We simply enter gdb into the dialog's File name box, as seen above, since we know from experience working with ESRI GDB that there is only one file with that name. Press Open. Back in the New Data Source dialog we verify everything is as we want and then we click Create Data Source. Manifold swings into action and, like magic, a new data source appears in the project using the name we specified. We can expand the new data source to see what it contains, in this case a drawing and its table. Double-clicking the drawing opens it. It looks like any other drawing, but it is being brought in from an "old format" ESRI file database using the GDAL/OGR library. Clicking anywhere in the project outside of the data source, we can do a Ctrl-V to Paste or press the Paste button in the Project pane's toolbar. If we double-click the pasted drawing to open it we see it is, of course, identically the same drawing that was copied from the data source. But this copy of that drawing is local to the project and is fully writable. 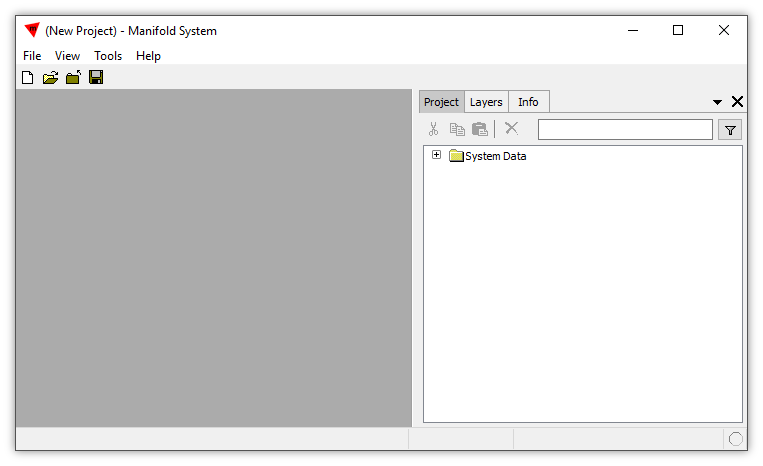 To delete the data source, we can click on the data source and then press the Delete key or click the Delete icon in the Project pane's toolbar. We now have the drawing that was in the "old format" ESRI geodatabase imported as a local drawing into our Manifold project. We can use the Style panel to format the drawing. Now would be a good time to save the project. GDAL is not Manifold - When connecting to GDB using GDAL/OGR we must be aware we are no longer using Manifold code but instead are using GDAL code. GDAL modules have been created over many years by different people and have varying quality, but GDAL has earned a good reputation. It is a tremendous advantage to use GDAL's very broad reach of modules from Manifold to connect to many niche or nearly-extinct formats, and GDAL does a great job at that. However, GDAL's code in general is not anywhere near as bulletproof as the Radian technology used in Manifold. GDAL code can and does crash, so connections to GDB using GDAL fall outside of Manifold's reputation for never crashing. Example: Connect Through Manifold ODBC to a Third Party - With Release 8, use an ODBC connection to a Manifold .map to connect through the .map project to a third party, external data source, an ESRI GDB file geodatabase. We use Manifold facilities as an intermediary to give Release 8 capabilities it does not have on its own, to link into data stored within an ESRI file geodatabase.